Common European Framework level C1 or higher*. There are ~10 universities in Netherlands which are in top 200 (worldwide). A variety of courses (around 25% of all courses) is taught in English. 95% of the inhabitants speak English which makes communication with the locals easy. There are around 90,000 international students in Netherlands (most of them are from EU region). Top degree choices from students are Economics, Behavior & Society, Engineering. 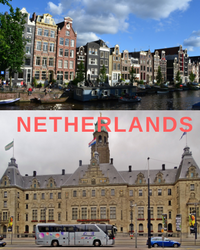 Many courses (Masters degree and Ph.D.) in Holland are offered in English. Known for its quality of education and Research Drive, 12 of 13 Netherlands Research Universities can be seen in the top 200 World University Rankings. Netherlands is also the proud occupant of the 5th place internationally for higher education and helps in augmenting knowledge through an organized system of upbringing and quality. opportunities is the low fees factor. While fees are cheap, there are plenty of opportunities in this country, the cost of living is quite high. The degrees are practical and industry oriented, making it very easy to get a job after graduation. The Dutch system of education is a give and take a policy which concentrates on working together to solve different problems. Higher education is broadly classified as Higher Professional Education (HBO) and University Education (WO), both of which offers the Bachelor's, Master's and Doctoral degree programs in various areas of concentration. Educational programs namely have (5 years) and two (6 years) are the selective secondary education provided and the senior secondary educational training namely MBA (1-4 years in 1-4 levels) are the pre-requisites for higher education. For a WO Program, a minimum of a two diploma or completion of the first year of an HBO program is required. For access to an HBO Program, a minimum of a have diploma is required, or a Level 4 MBA diploma. For admissions to a combined Program, the student must have completed one of the subjects that satisfy the fundamentals of the program in question. Situated at Utrecht, it is one of the largest Universities in Netherlands. It is ranked number 1 in the Country and holds a World ranking of 50-55. It is specialized in various areas ranging from Humanities and Science to Law. It is the only University in the Country to have the largest number of English language courses. It is located in Leiden and is the oldest University in Netherlands founded in 1575. It is ranked number 2 in the Country and holds a World ranking of 70-75. It offers various degree programs in areas such as Medicine, Humanities and Applied Sciences with the best reputation for its Law school. Situated in the capital city Amsterdam, this University is one of the best Research University in Netherlands. It is ranked 3-5 in the Country and holds a World ranking of 100-150. It offers various programs and degrees but is well reputed in the field of Medicine and has the largest number of admissions. Situated in the city of Groningen, this University is one of the oldest Research University in Netherlands. Founded in 1614, this University is quite popular for its various degree programs and its Zernike Institute for Advanced Materials. Located in Delft, this University is one of the largest Public Universities in Netherlands. It is ranked 8 in the Country and holds a World ranking of 150-200. It is a prominent University for engineering related studies and has a big name in Research through its various institutes like Netherlands Institute of Metals Research and Delft Center for Engineering Design. Huddled between France, Germany, and England, this Country renders a cocktail experience of Europe's Three major cultures and serves as an entry point into International education which makes it the ideal choice for students from all ethnic backgrounds. if you are a foreign student (non-EU/EEA/Swiss) and you have a valid residence permit with the aim to study, you can work alongside your studies then you can do full-time seasonal work in June, July and August, or part-time work of no more than ten hours a week outside the summer period.